In the late 1970's I was stunned one day to pick up the newspaper in New York and read that I had been executed in Georgia. The deceased shared my exact name. We were only a few months apart in age. I wondered about this twist of fate many times over the ensuing decades. The fact that I was white and the other Robert Williams was black, almost explained his fate to me. I imagined that, were I in his shoes, I would not have received the Death Penalty. 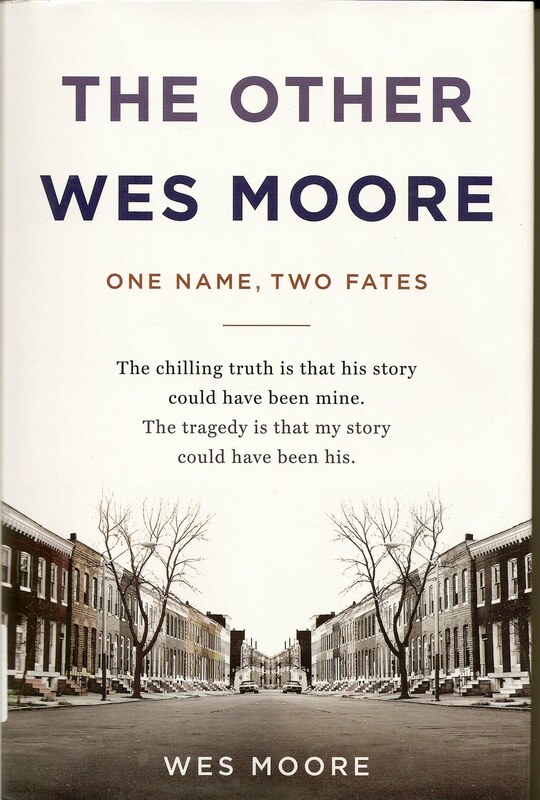 Wes Moore has taken us one step further with this exciting and introspective book. In the fall of 2000 a group of young men in Baltimore, my old hometown, robbed a jewelry store. The robbery went bad and people were killed. 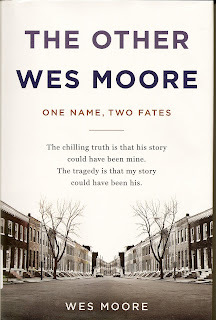 One of the criminals was a young man named Wes Moore. He grew up in Baltimore, had no father, roamed the streets and went to school casually, that is, whenever he felt like it. To read about his life seemed "typical" and the reader was left unmoved. It was expected. Two months later, the same paper carried a story about a young man, named Wes Moore, who had just earned a Rhodes Scholarship in Baltimore. He grew up in New York, attended similar schools, ran the streets and both had no fathers at home. How did these two come to such different endings? The social and economic patterns were almost identical in both of their lives. What was the difference that led one man to a sentence of Life without Parole, and the other to a life of Education and World Travel. This book follows the paths of the two men, who were born into almost identical circumstances, and yet wound up at opposite ends of the spectrum. That they shared the same name is even more remarkable and serves to underscore the role that Fate plays in all of our lives. Wes Moore, the author, journeys to Jessup Correctional facility, located near BWI Airport to conduct a series of interviews with the incarcerated Wes Moore. He explores the differences, as well as the similarities, which bought them to such different ends. What was the key that made one turn away from Education and Advancement, while the other embraced it? This is one of the best books about life on the streets of Baltimore since "The Block" by David Simon and Edward Burns, who also wrote "Homicide: Life on the Streets." The biggest difference is that this book was written by one of the people who lived the life. The other book was written by someone from outside of that world. In the final analysis it is attitude that makes the difference. The attitudes of both those that surround you, as well as the attitude that you carry inside, can make all the difference in the world. Just ask Wes Moore. Either one.